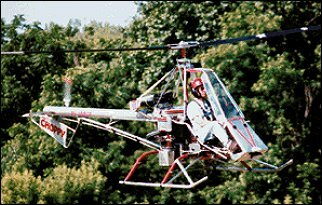 A single seat open frame helicopter. The frame is 4130 steel main frame and bolt-together aluminium tube. A modern version of the Adams-Wilsom Choppy helicopter. Single-seat open-frame helicopter with a Min Speed Hover speed. Video covers flight and testing. All new aluminum tube tail design. New replaceable landing gear. Easy build design for the true homebuilder. Scratch build entirely from plans; CAD plans $95 in 2009. Engine: 66 hp Rotax 582 or Hirth. Top speed: 85 mph / 137km/h.